The keyword in the telecommunications world today is “mobility”. More and more consumers want to make calls, access email, chat with friends and enjoy online services not only from the convenience of their homes and offices but also from any location. While wireless technology for data transmission has been around for quite some time, limitations in bandwidth and area coverage have prevented providers from using it for mass deployments in the past. Today, however, innovations like the 801.g WiFi standard and the introduction of Super-G and Extended Range (XR) technologies have made it feasible and cost effective to deploy city-wide wireless access networks and offer revenue-generating mobile wireless access services. As demand for wireless mobile access is expanding, both traditional and emerging service providers look for ways to capitalize on it. 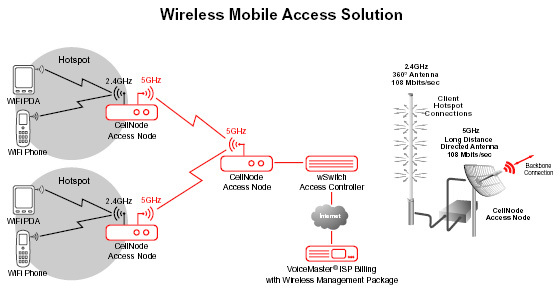 As a result many service providers consider implementing Wireless Mobile Access business model. The essence of such model is the deployment of wireless data transmission infrastructure in areas with high population density and offering of mobile access services. Subscribers for such services can access the Internet from any location with network coverage and can roam between different access points within the network without service interruption. To address the equipment needs of service providers who want to get into such business, SysMaster offers end-to-end Wireless Mobile Access Solution. The solution features intelligent mobile access, robust access control and powerful billing and CRM capabilities. Utilizing a mesh network infrastructure with roaming among access points and bandwidth optimization, the solution ensures high bandwidth and reliable access for all users located within the network boundaries. VoiceMaster® ISP Billing Platform, a robust and feature rich billing server that allows ISP providers to authenticate and bill their subscribers in wireless roaming environment. CellNode, a unique wireless access device that is designed to operate in WiFi mesh infrastructure with central management and provisioning, and built-in network optimization. The CellNode device supports both 2.4GHz 802.11b/g mode for communication with wireless client devices and 5GHz 802.11a mode for backbone transport.